Spoiled, arrogant, filthy rich, and breathtakingly beautiful, the young Lady Godiva Dacre is exiled from the court of Good Queen Bess (who can't abide red-haired competition) to her lonely estate in distant Cumberland, where she looks forward to bullying the peasantry and getting her own imperious way. Little does she guess that the turbulent Scottish border is the last place for an Elizabethan heiress, beset by ruthless reavers (many of them unshaven), blackmailing ruffians, fiendish Spanish plotters intent on regime change, and turning Merrie England into a ghastly European Union province. And no one to rely on but her half-witted blonde school chum, a rugged English superman with a knack for disaster, and a dashing highwayman who looks like Errol Flynn but has a Glasgow accent. To say nothing of warlocks, impersonators, taxi-drivers riding brooms, burlesque artists, the drunkest man in Scotland, and several quite normal characters. 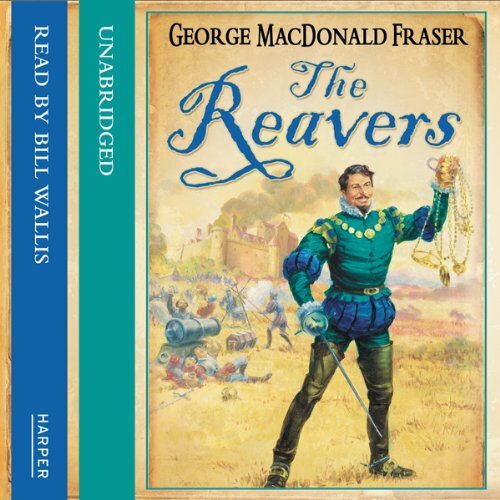 Oh, yes, gossips, it's all happening in The Reavers, a moral tale obviously conceived in some kind of fit by Flashman author George MacDonald Fraser...well, he's getting on, and was bound to crack eventually. He admits (nay, insists) that it's a crazy story for listeners who love fun for its own sake. I downloaded The Reavers on the basis of its two, existing 5 star reviews and the fact that I've loved the Flashman books in the past. How disappointing. I've only listened to an hour of the eight so far, and I'm not sure whether I'll continue. So far it's taken an awfully long time for the plot to start developing, but it is well read, and the voice characterisations are very good. It's not great on historical detail and there are some curiously modern pop culture references, but some of the humour is quite engaging. All in all, not a five star audio book by any stretch of the imagination, but bits are quite fun. Fabulous characters with tongue firmly wedged in cheek. If you want historical niceties this isn't for you but it is very funny. Really good fun and the narrator Bill Willis sticks to the accents of the book, with hysterical results. It can be a bit difficult to hear when you first get stared but the ear soon tunes in. What a surprise. I downloaded this because it was cheap and was historical but it ended up being one of my favourites! Bill Wallis is brilliant, and if you love language, you will love this. Fans of GMF - do not listen to this book! I am afraid to say that this is an awful book. I am a great fan of GMF, especially his Flashman novels, and assumed this would be up to his usual fantastic standards. Unfortunately, despite the introductions claims that this book is merely a humourous poke at how seriously life is taken nowadays, there are just a spattering of genuinely funny moments in an otherwise slapstick mess. The action is all over the place and the insistence of the author to write in the regional accent of the character clearly made reading it beyond the talents of the narrator. The narrator faithfully reads the text exactly as it is written, apostrophes and all, rather than naturally adopting the accent as it is intended - this renders some of the passages absolutely unintelligable. Anachronistic references to technology and pop culture only detract from the story and are just not funny. This is the late, great authors last offering, and the positive reviews the book received are, I believe, testament to the warm affection that people held for the author rather than any actual literary merit. Sorry.